As we enter the final weekend of Emily Jacir’s exhibition at IMMA ‘Europa’, ending this Sunday 26 February, we hear from Emily Jacir on the second week of her workshop “To Be Determined (for Jean)” which took place during the month of January in conjunction with her exhibition. Conceived and organised by Jacir, in collaboration with IMMA, the workshop was based around a student collaboration with Jacir’s students from the International Academy of Art Palestine, Ramallah and a number of Irish students. IMMA invited colleges throughout Ireland to nominate students to participate, resulting in students from Limerick School of Art and Design (LSAD); Galway-Mayo Institute of Technology, Centre for Creative Arts and Media (GMIT CCAM); the National College of Art and Design (NCAD), Dublin and Dublin School of Creative Arts, Dublin Institute of Technology (DIT). 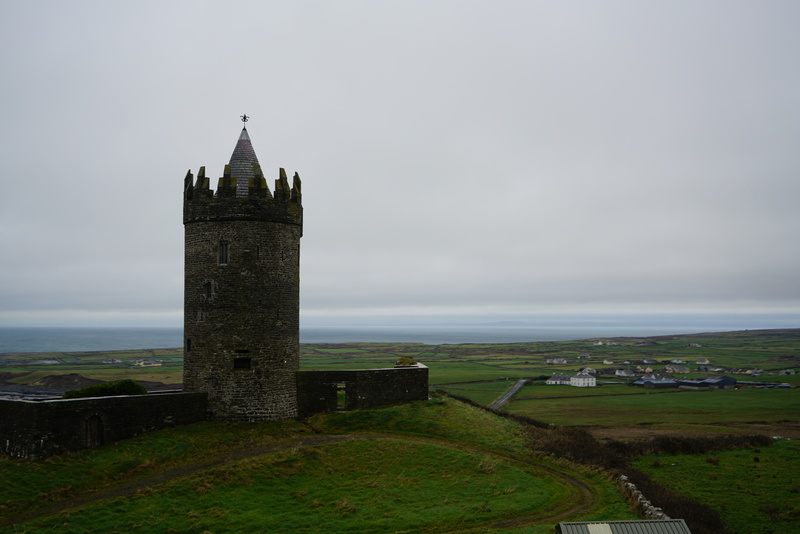 In the second week of the workshop the students traveled to the Burren College of Art, Co. Clare where they worked with Conor McGrady and Áine Phillips. On their return to Dublin they participated in workshops by artists Gerard Byrne and Shane Cullen. 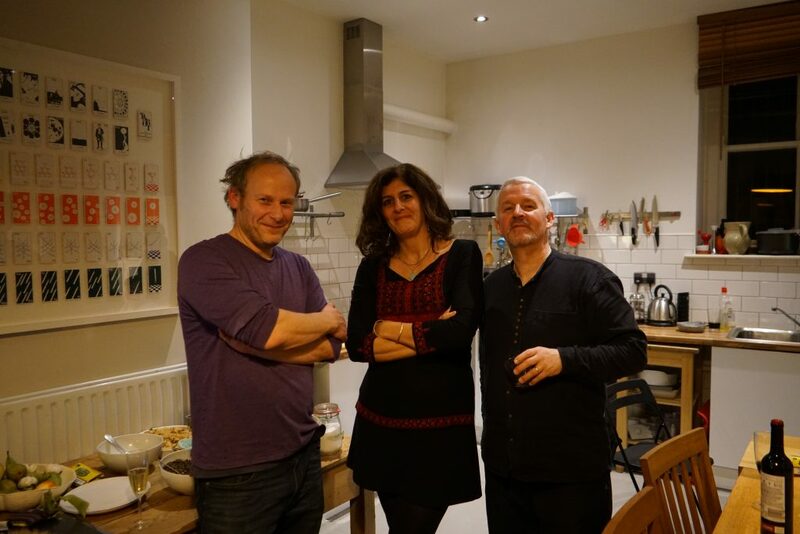 Here we hear from Emily Jacir and the participants in the programme, both artists and students, on their reflections on the second week and what the workshop meant to them. 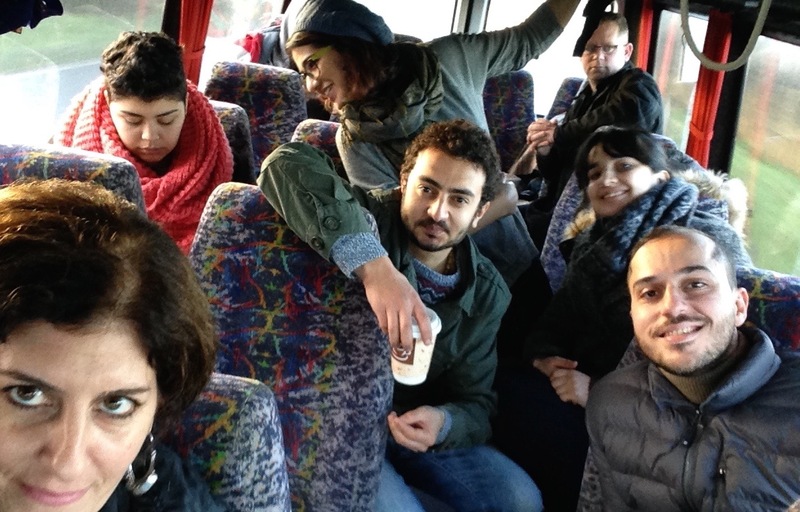 Read the blog from week one by Emily Jacir and the participants in the programme. Emily Jacir’s new installation at IMMA, “Notes for a Cannon”, which she describes as throwing open her sketchbook, constellates histories of Palestine and Ireland in a magnetic field of correspondence and convergence. We could think of the two week-long workshop as aiming at something similar: not a process of instruction or “information delivery”, but an ongoing, collective sketch-work that kept discovering past and present interconnections between two sites that are geographically remote but bound together by actual and analogical links. Both the land and the culture of Ireland and Palestine are marked by imperialism and settler colonialism and by an enduring resistance to them. The fragmentary and episodic connections traced between them may look like the debris of historical damage, but are charged with the openness to the future that the imagination and forging of life in common inspires. – David Lloyd, Distinguished Professor of English at the University of California, Riverside. 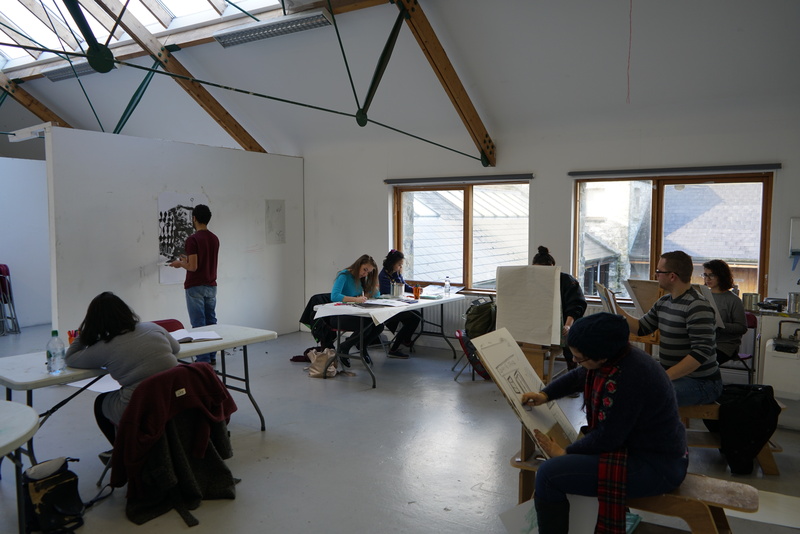 On our second day at the Burren we started with a drawing seminar in the beautiful studios of the Burren College of Art, pictured below. This session focused on using drawing as a way for the students to process in their own language the many things they have been confronted with on this journey together. After lunch Áine Phillips presented us with her lecture entitled “Contemporary Live Art: Colonialism and Gender in Ireland”. This was followed by a field trip to an abandoned famine village. 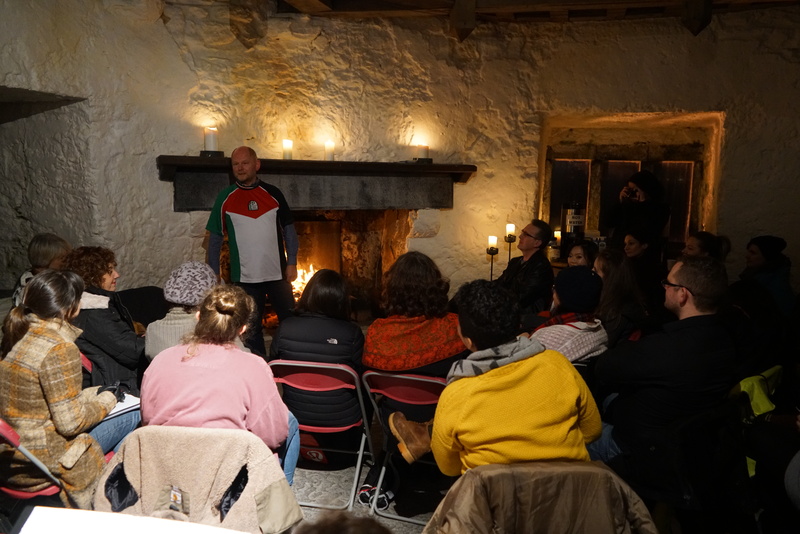 The day ended in the castle at the Burren College of Art where a fire was lit and local musicians and poets from County Clare came and shared their gifts with us. 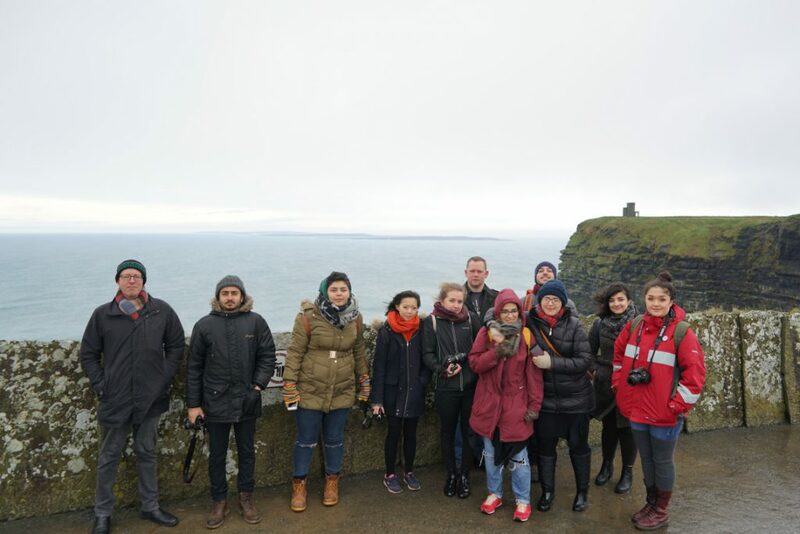 Burren College of Art was pleased to participate in Emily Jacir’s workshop, that brought a group of her students from the International Academy of Art Palestine to Ireland to work with students from four Irish colleges over a two week period. 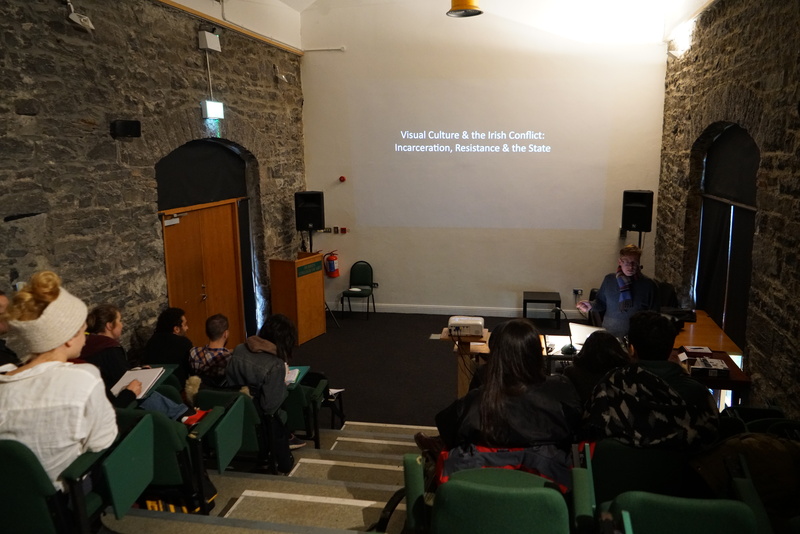 At BCA seminars were complimented with intensive discussion, reflection and visual documentation/drawing in response to issues impacting art and politics in Ireland and Palestine. Emily’s workshop comes in the wake of the centenary of the 1916 Easter Rising and at a critical conjuncture in contemporary global politics. 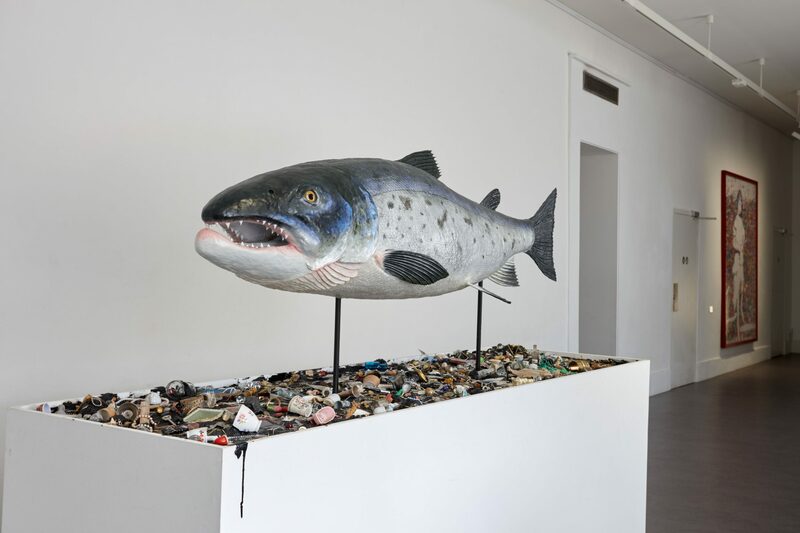 In engaging with Ireland’s past and Palestine’s present, it posed important questions on the role of the artist in responding to the social, cultural and political legacies of colonialism and conflict. It was an honor to work with Emily in this important initiative, and to share time, space and discussion with such a dynamic group of committed and enthusiastic students.– Conor McGrady, Burren College of Art. After our return to Dublin we wrapped up the last few days of the workshop with seminars with artists Gerard Byrne and Shane Cullen (pictured below) regarding their practice. Gerard and Shane and I also conducted one on one tutorials with the students to discuss their work and the new projects they are embarking on inspired by the workshop. 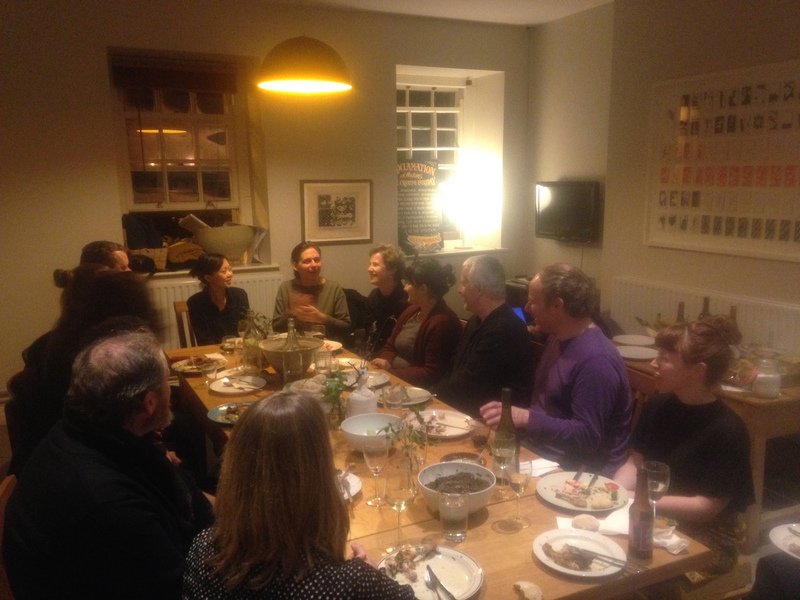 Final dinner with artists, students, participants in IMMA’s Residency communal house. The workshop has been over for nearly a month now and I’m still picking apart and digesting the experiences that were cultivated during those intense two weeks. In my mind, the second week of the workshop is a blur of wild landscapes hurtling past the windows of our bus, beautiful food shared with beautiful friends and songs sung in both familiar and unfamiliar languages (of which I still find myself idly humming along to). I rediscovered the power of drawing. I was reminded of the value of song and spoken word. I learnt about the importance of making work locally, for yourself and for your neighbours. It’s difficult trying to chronicle or sum up the happenings of the workshop and I think it would not be helpful to do so right now. I can only express my undivided gratitude to the many wonderful people I was fortunate enough to meet. May this be only the beginning. – Yurika Boo. Emily’s proposal for a student workshop, which she presented to IMMA’s Engagement and Learning team during the early planning stages of her exhibition, provided a way for IMMA to further explore how we can be a support and locus for research and student interaction. The collaborative approach of the workshop involved many individuals and organisations coming together through seminars, lectures, site visits, excursions, and also meals which provided important opportunities for the learning and experience to be digested. Taking place against the backdrop of Emily’s exhibition at IMMA, this student workshop provides a rich model for future student collaboration and exchange which we hope to build on in the development of IMMA as a site for research and learning. – Lisa Moran, Curator: Engagement and Learning, IMMA. Emily Jacir. Photo John McRae, 2016. 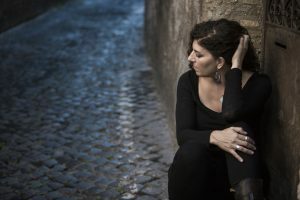 Emily Jacir’s recent solo exhibitions include IMMA (Irish Museum of Modern Art), Dublin (2016 – 2017); Whitechapel Gallery, London (2015); Darat il Funun, Amman (2014-2015); Beirut Art Center (2010); Guggenheim Museum, New York (2009). Jacir’s works have been in important group exhibitions internationally, including the Museum of Modern Art, New York; San Francisco Museum of Modern Art (SFMOMA); Fondazione Sandretto Re Rebaudengo, Turin; dOCUMENTA (13) (2012); 5 consecutive Venice Biennales, 29th Bienal de São Paulo, Brazil (2010); 15th Biennale of Sydney (2006); Sharjah Biennial 7 (2005); Whitney Biennial (2004); and the 8th Istanbul Biennial (2003). Jacir is the recipient of several awards, including a Golden Lion at the 52nd Venice Biennale (2007); a Prince Claus Award (2007); the Hugo Boss Prize (2008); the Herb Alpert Award (2011); and the Rome Prize (2015). In 2003 O.K. Books published belongings. a monograph on a selection of Jacir’s work. A second monograph was published by Verlag Fur Moderne Kunst Nurnberg (2008). Her book ex libris was published in 2012 by Buchhandlung Walther König, Köln. In 2015 The Khalid Shoman Foundation published A Star is as Far as the Eye Can See and as Near as My Eye is to Me the most extensive monograph to date on Jacir’s work in English and Arabic. The most recent publication on her work are Europa which accompanies the exhibitions at Whitechapel and IMMA. Earlier this year NERO, Roma published TRANSLATIO about Jacir’s permanent installation Via Crucis at the Chiesa di San Raffaele in Milano. She has been actively involved in education in Palestine since 2000 including PIVF and Birzeit University. Over the past ten years she has been a full-time professor and active member of the vanguard International Academy of Art Palestine in Ramallah. She conceived of and co-curated the first Palestine International Video Festival in Ramallah in 2002. She also curated a selection of shorts; “Palestinian Revolution Cinema (1968 -1982)” which went on tour in 2007. Jacir is on the faculty of Bard MFA in Annandale-on-Hudson, NY. This month we are presenting "To Be Determined" a workshop with artist Emily Jacir in conjunction with her current exhibition at IMMA - Europa.